What do you get when you combine rhyme, ducks, and a kiddie pool? Another great book from David Melling! Splish, Splash, Splosh! 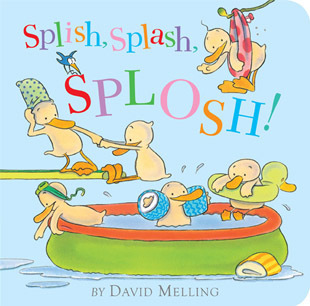 is a counting book filled with watery fun. Your youngster will be delighted to count from one to ten with the fluffy ducks as they go waddling, flapping, grinning, jumping, and splish, splash, sploshing away. This book is adorable and funny. Even I couldn’t help but laugh as I watched the ever increasing number of ducks and their poolside antics. Simple text, loads of action words, and cute illustrations fill this one. 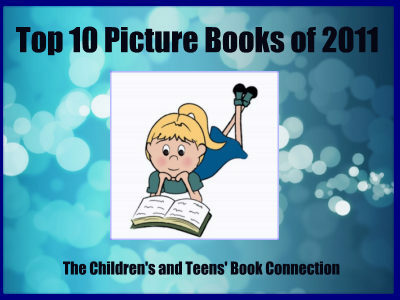 Even if your child has a dozen counting books, you need to make room for this one. 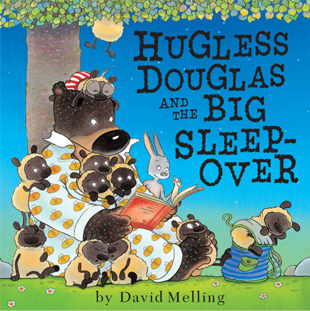 Get ready for another zany Hugless Douglas book by author/illustrator David Melling. Douglas is all excited to be sleeping over at rabbit’s house. He packs plenty, because there is so much room at rabbit’s. On the way, he invites Little Sheep along, too. When Douglas arrives with a ton of guests for rabbit’s sleepover, there’s not enough space for everyone. How will they ever get to sleep? This book is a riot. I’ve loved all three Hugless Douglas books, but this is my favorite. Silly antics and crazy pictures fill this book with tons of fun. Melling has such a wacky style that he creates wonderful characters that offer loads of comedic entertainment. I also love the hidden details you catch here and there along the way. The last two pages of this book have illustrations that match answers to the question, “What would you pack for a sleepover?” The sheep, rabbit, and some screwy birds help illustrate the answers. Hugless Douglas and the Big Sleepover is a great book for bed time or anytime. I can’t wait to see what future adventures lay in store for Douglas and his friends. I received this book from the publisher. This review contains my honest opinions, which I have not been compensated for in any way. Douglas is back with an all new dilemma. When his father gives him a new wooly hat, he reminds Douglas to be careful with it. Then something terrible happens. His hat gets caught on a tree and ends up like a long string of spaghetti. His animal friends try to help, but Douglas is going to need to tell his dad what happened. That sure won’t be easy. 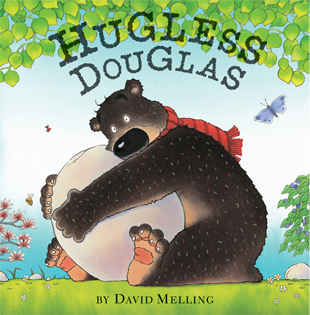 I fell in love with Douglas when I read the touching story titled, Hugless Douglas. 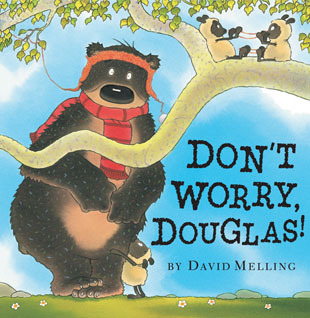 Now David Melling is back with another Douglas story that will warm your heart and make you laugh. Don’t Worry, Douglas! is a beautiful book that teaches children the importance of telling the truth. What Melling does so well in this book is capture the feelings children go through when something has gone wrong and they must approach their parents. The book is filled with some well-meaning and some not so selfless friends, which is true of the environment in which children grow up in today. Melling’s artwork in this one is superb. He is able to capture so many emotions with his illustrations: the glee of having fun, the shock of something unexpected, the despair of knowing you must face the music, and the joy of learning it will be all right. This is one of my favorite series of books. I can’t wait to see what Douglas is up to next! Does anybody have a hug they can spare? Poor Douglas wakes up one spring morning needing a hug. He steps outside and tries to remember what his hugs are like. They’re big, tall, and comfy. But everything he tries to hug doesn’t feel right or runs away. Maybe he’s just going to stay Hugless Douglas. This fabulous and funny book written and illustrated by David Melling is going to become a quick favorite. Hugless Douglas is as touching as it is silly. Melling is masterful in his telling of the story of a young bear who is seeking a hug and can’t seem to get one from anyone of anything. The last two pages of the book contain some zany hugs your kids will probably try on you. Hugless Douglas is a delightful book. I’ll be on the lookout for more books by David Melling.